The Profoto ComPact-R 600 Value Pack offers the simplest and most economical way to get the best quality of light with the Profoto modular system of light shaping tools. 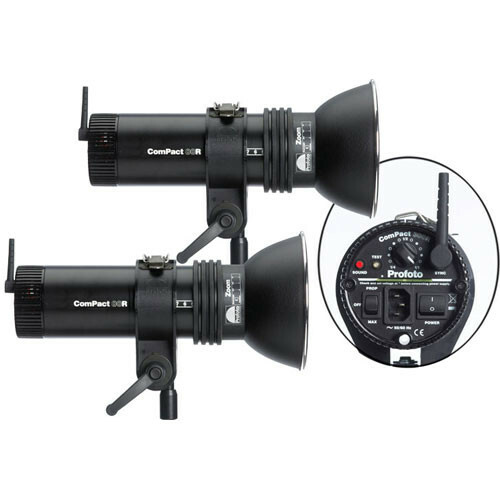 This 2 monolight kit provides up to 1200 watt/seconds of stored power. Compact units share the same quality of light as all other Profoto flashheads. Profoto ComPact units provide very high light output, fast recycling, and short flash duration for their size. Each monolight in this kit includes a built-in Pocket Wizard brand 32 channel radio slave receiver. Efficient fan cooled design assures continuous heavy-duty use. On location or in the studio, they are perfect for fast set-up and break-down. With their lightweight, small dimensions, and multi-voltage capability, one or several can be easily packed for travel in a case of your choice. A removable Voltage Key Card allows instant adjustment of the line voltage anywhere in the world; just switch power cables and modeling lamps. Each monolight has a built-in Pocket Wizard Radio Slave. It will fire the flash, when triggered by your Pocket Wizard Transmitter or transceiver. A removable Voltage Key Card allows instant adjustment of the line voltage anywhere in the world; simply switch power cables and modeling lamps. A highly sensitive optical slave enables synchronization with other flashes. No tools are required to replace this "plug & play" flashtube. 3 Month Warranty when purchased for rental. Does not cover flash tubes, glass covers or modeling lamps.